Many of your marketing efforts are likely designed to achieve those goals or similar measurements of success. But there’s one approach that firms often overlook that can achieve all of these goals—and more. This approach is thought leadership marketing and the development of Visible Experts. These experts are the professionals who give keynote addresses at industry conferences, write the defining book in your field and have established themselves as the go-to authorities. And while it might seem like they’re only reaping personal benefits, these thought leaders have the ability to generate more leads for their firms, boost firm reputation, establish market leadership and increase credibility. Visible Experts can help you close more business at higher rates to grow your firm and increase your revenue. This raises the question: why isn’t everyone doing it? 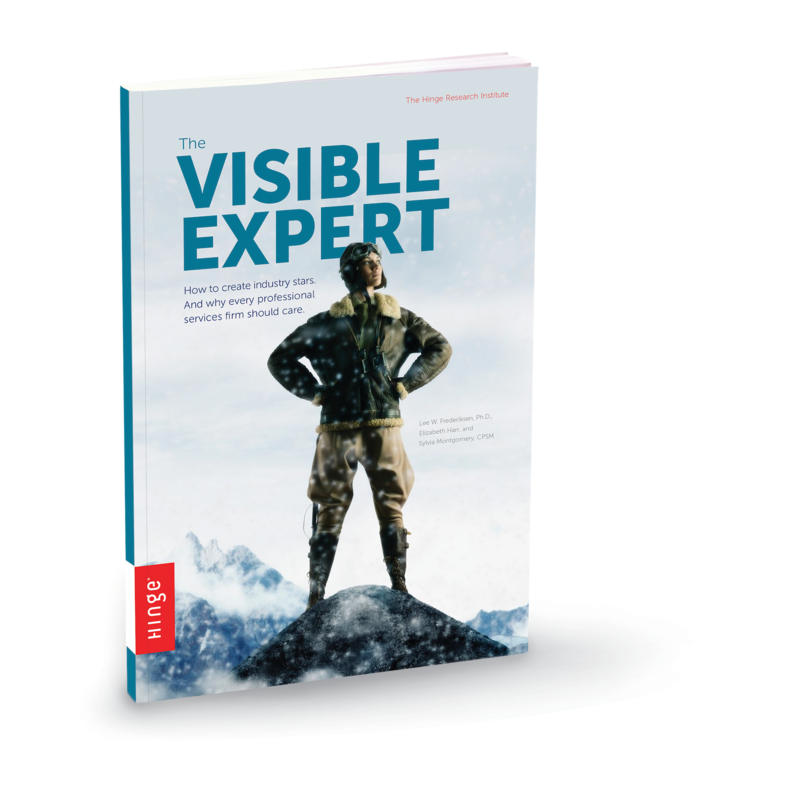 The answer could lie in the misconception that a Visible Expert is something that you are, rather than someone you become. We should know—we interviewed 130 of them and chronicled their rise to industry stardom. Our research also led us to survey more than 1,000 buyers of expert services to examine the value they place on expertise. To put it mildly: we learned a lot. One of the biggest takeaways from our interviews was that, regardless of their varying backgrounds and industries, the majority of our Visible Experts seemed to follow a similar trajectory. Through that pattern we were able to develop a recommended path consisting of seven steps for aspiring industry stars. Select a Candidate. Determine who would make the best Visible Expert in your firm. While experience is certainly an important factor, a good candidate also needs to have a combination of practical and ideological skills. They need to be both available to take on the task and able to work extremely hard. Assess Their Status. Perhaps your candidate already possesses a mild level of visibility on which you’ll be building. Or, you might be starting from scratch with someone who has made very few ripples in your industry. Regardless, you need to know where you’re starting from to make a plan for where you want to go. Develop a Strategy. Consider your candidate’s potential niche, their target audiences and the tools you’ll be using to increase their visibility. Build Their Infrastructure. This refers to the basic marketing materials and online tools your candidate will need to get your campaign started. Professional headshots and bios, a strong website, a clear presence on social media platforms and a speaking engagements page are all good places to start. Develop Their Personal Skillset. Address the areas that need improvement, and help your candidate slowly add new skills into their routine to make them as well rounded as possible. Grow Their Expert Brand. Create content, and put it out there. Use a mix of different mediums and approaches to reach as much of your target audience as possible. Track and Adjust. Examine what works and what doesn’t, and change what needs changing. Review a variety of metrics from your different channels to get a full picture of how your candidate’s star is rising within your industry. While developing a Visible Expert isn’t likely to happen overnight, these seven steps make it an accessible opportunity for any firm willing to put in the effort. If our research is any indication, the benefits will be well worth it. Sylvia Montgomery is a Senior Partner at Hinge, a marketing and branding firm for professional services. At Hinge, Sylvia provides strategic counsel to national clients. She is a co-author of The Visible Expert, Inside the Buyer’s Brain and Online Marketing for Professional Services. You can follow Sylvia on Twitter @BrandStrong.